Yes, April is L’Oreal Nail Polish of the Month and to celebrate 🎉 (I promise this the only bit of celebrating for POTM) I am showing my favorite colors from this line. 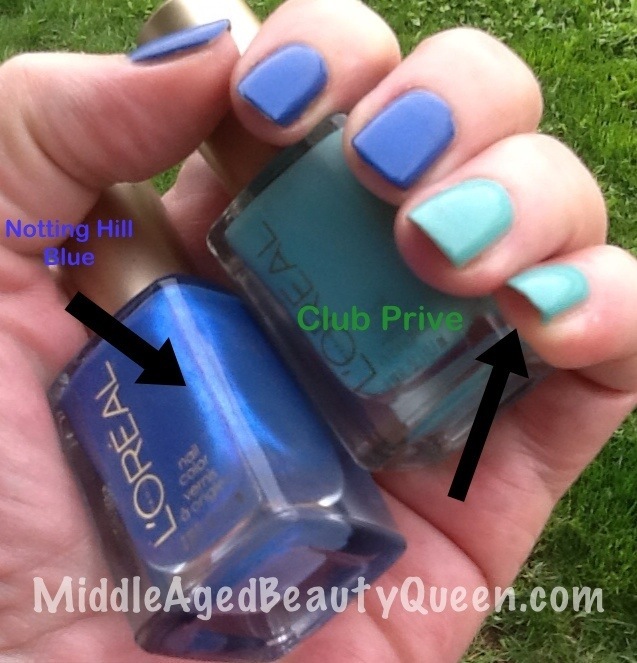 Notting Hill Blues and Club Prive from L’Oreal are 2 of my favorite colors from L’Oreal not only because I love blue and green together but the Notting Hill blues makes me think of my friend Diana, whom I miss very much. 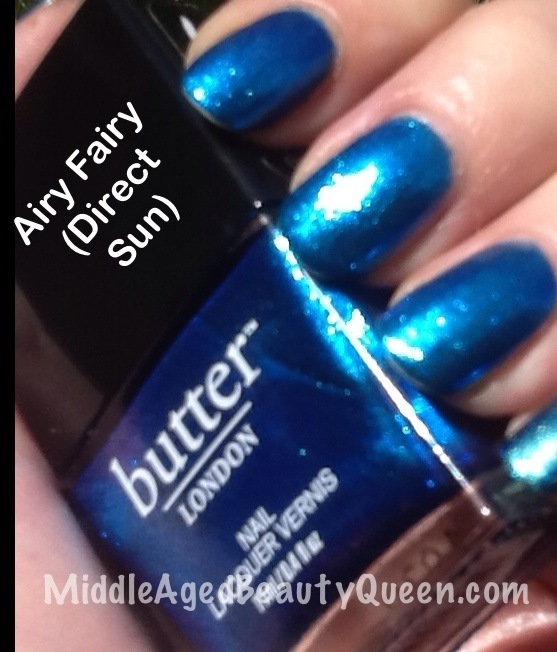 (Diana lives in England and before the ban of mailing nail polish abroad I dId send her a Notting Hill Blues bottle of polish. I hope she likes it as much as I do and I hope she thinks of me when she uses it, as I do of her.) . Did that make sense to anyone but me? 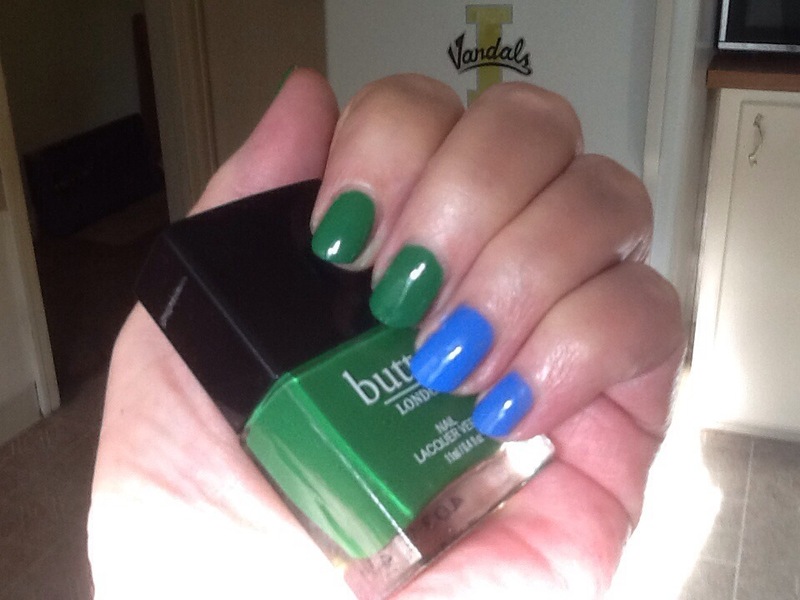 I love the half and half manicure, I like to think I invented this, and I especially like it with a blue/green combo. The L’Oreal Notting Hill Blues and Club Prive are perfect for this look. 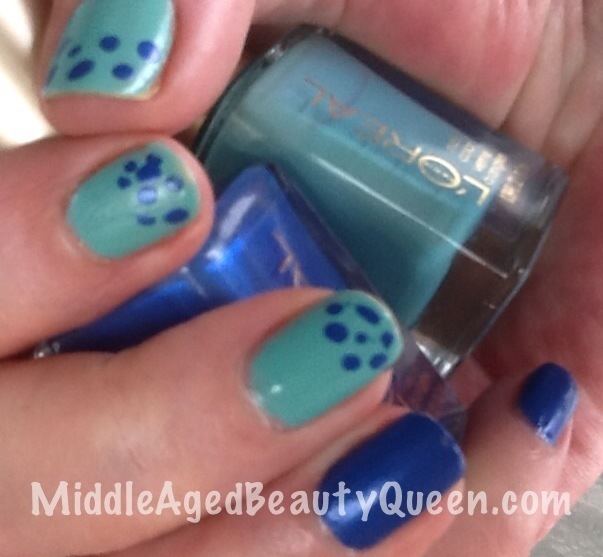 If you want to get artsy with your half and half manicure, it is easy enough to add spots with the contrasting color. I used a toothpick on a couple of nails to be able to show you. 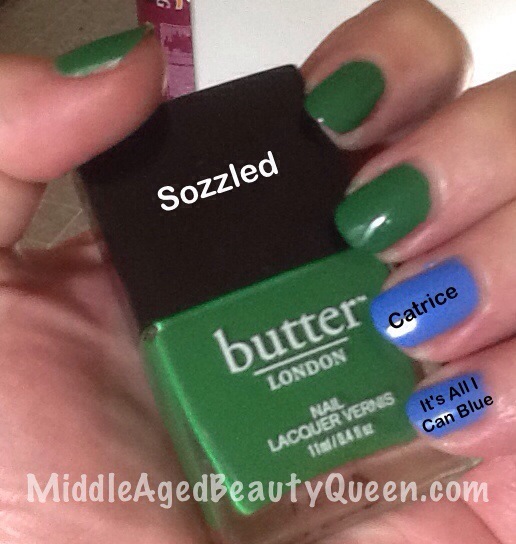 I think it would be kind of fun to add some more Club Prive (green) into the dots of the Notting Hill Blues dots. The formula for L’Oreal nail polish is cinsistently good, not too thick, not too thin. I have several colors and have been nothing but pleased with this brand. You can purchase L’Oreal Nail Polish where most L’Oreal make up items are sold, which is in most drug stores. The retail price is around $5.99 but I always check the sale sections and have found some great deals that way, also, at my Walgreen’s if I ask the cosmetic counter cashier for coupons she usually always has one for L’Oreal. So keep this in mind. 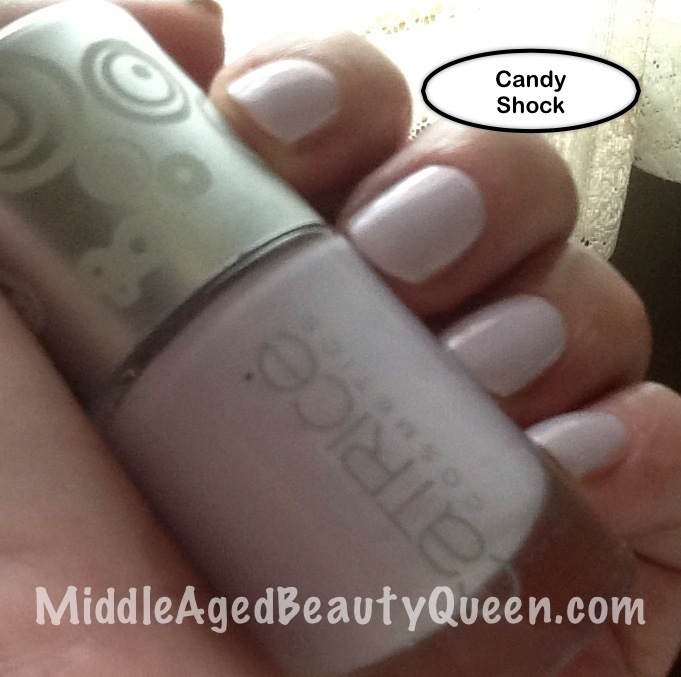 Candy Shock from the I Scream, You Scream LE Collection from Catrice is a perfect Spring pastel color. This is a light, light lavender with a small pearl shimmer. 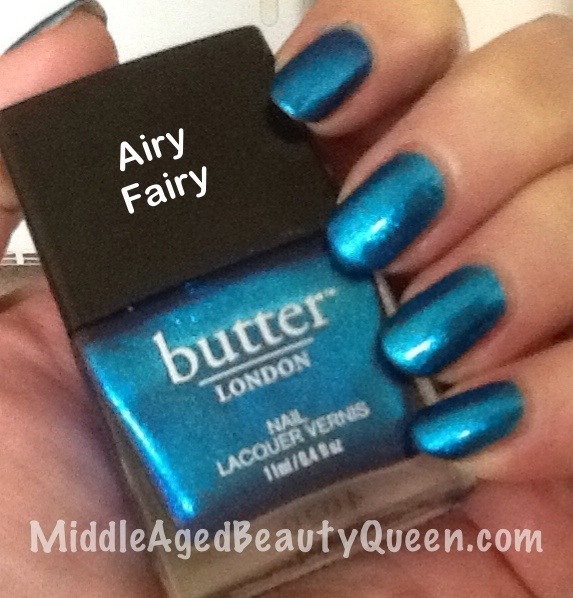 As with most Catrice nail polishes with a shimmer, it does transfer to the nail,beautifully. 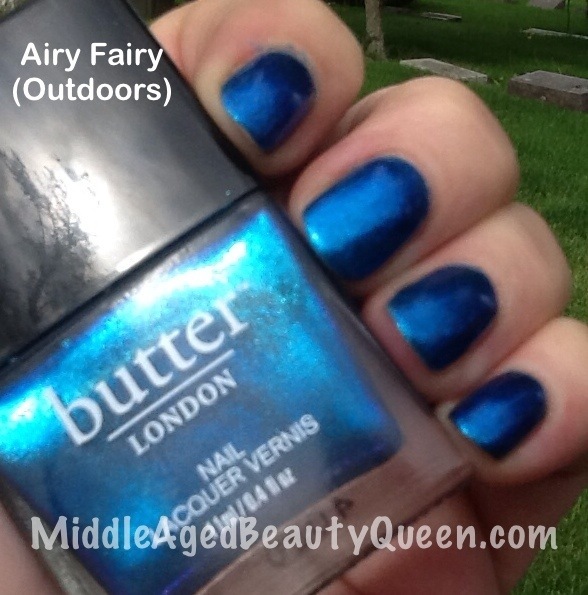 The formula for this polish was easy to work with, even though the first coat was a bit streaky it was completely opaque and smooth with the second coat. This one definitely needed a second coat, as advised on the bottle. One of the things I like about this brand. You know going in if it’s a one coater or two. 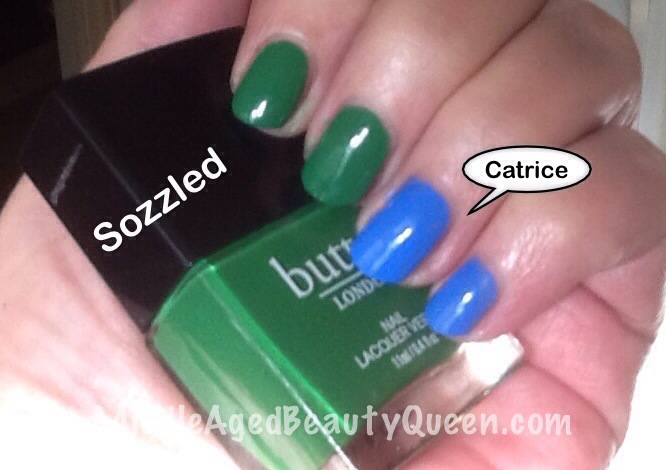 FINAL THOUGHTS ON CATRICE AS POLISH OF THE MONTH: Catrice is a German brand of polish that can be tricky to find. I did not check eBay but I’m sure you will find some there. Catrice is available at the Ninja website for $10 per bottle. Catrice is a great brand, another one of those brands that I wished was more readily available in this country. I hope you get a chance to try it, and if so, please let me know what you think! Because Catrice is a nail polish brand not readily available in our country, I almost decided against making it the Polish of the Month. But, it is a great polish, an innovative brand, and I did find a reliable outlet to purchase Catrice. 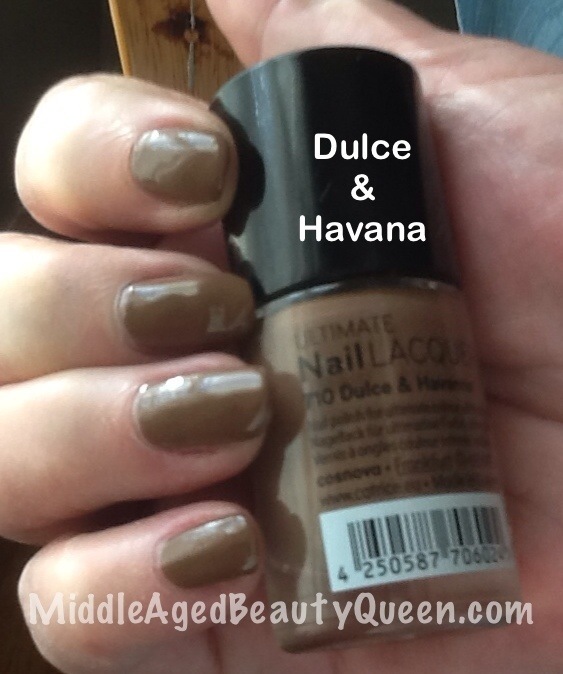 Dulce & Havana from Catrice is a straight up brown, cream finish, no shimmer, no sparkle, no glitter. It is the color of a chocolate candy bar. The formula on this one was a bit thick and I most definetly should have stopped with 1 coat. 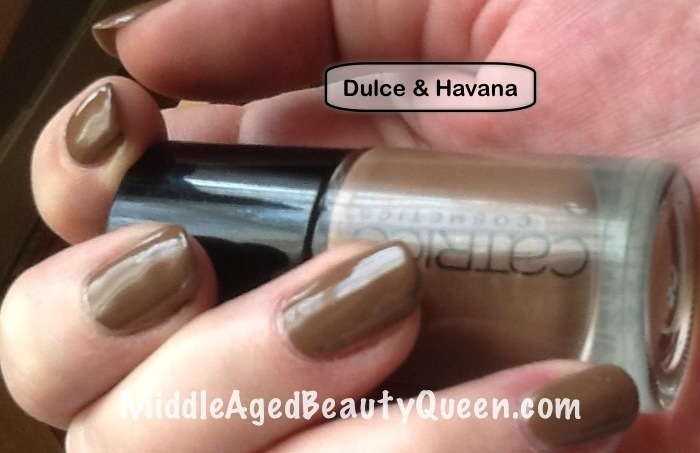 Catrice will tell you in the bottle if more than 1 coat is needed, just one of the things I like about this brand. The brushes are another thing I like about this brand. It is a flat wide brush. Not as wide as the Sally Hansen CSM or the Wet n Wild Mega Last brushes. I like a flatter, wider brush, the Sally Hansen CSM is my favorite brush. So this one was nice to use. The brush picks up just the right amount of polish for a smooth easy application. I wore this color for a couple of days and no sign of tip wear, and certainly no chips showed up. Even with this dark of a color. I have quite a few Catrice nail polishes by the kindness of my friends, one who lives in Germany and one who lives in Ireland. 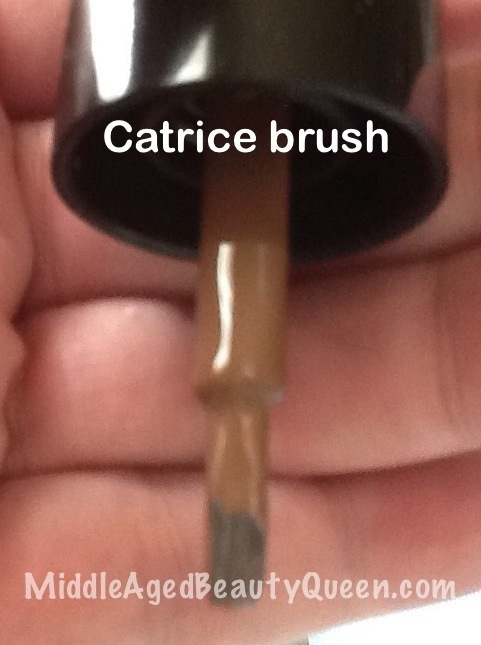 Catrice is a drugstore brand. They come in a full range of colors, all with cheeky names. I checked all my usual outlets to purchase and only Ninja.com have these available. I haven’t bought anything from this website but I know a few people who have and they have been very happy with the service. The price for Catrice is $10. Catrice have a bunch of new colors and they have a new formula called “shine booster technology”. I’m guessing it makes the polish more shiny? FINAL THOUGHTS: Even though I haven’t tried the new formula or the website I have no doubt you will love this polish. It is very much worth the $10. 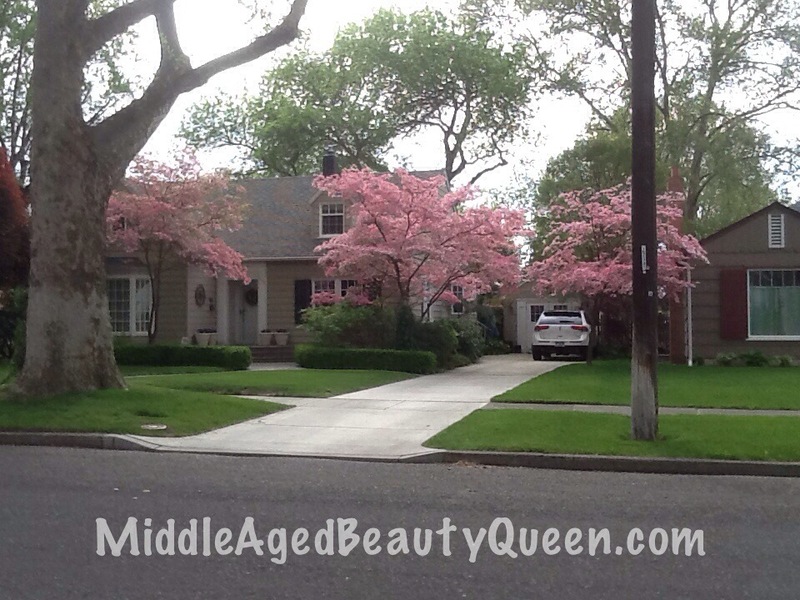 I am looking forward to showing you more Catrice brand this month. 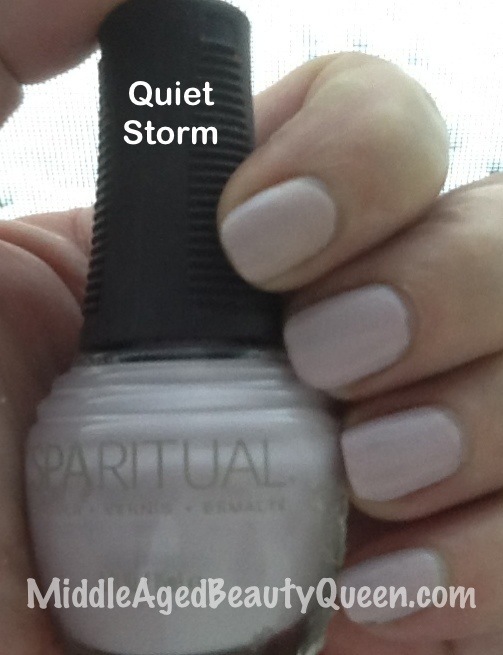 Quiet Storm from Spa Ritual is a nice pastel pink-ish/lavender-ish color that is right on trend for Spring 2014. These pictures are 2 coats with a coat of Seche-Vite. Also, these pictures were taken after more than a week of wearing. I know, shocker! right? I have been staying at my day’s house while he is gone to Maui for a month. I didn’t have all my nail stuff until today, hence the actual testing for wear time. As you can see there is no sign of wear. Another reason to love this brand. Like most pastel cream polish, the first coat went on very streaky and chalky but as in most cases, the 2nd coat evened all those problems out. 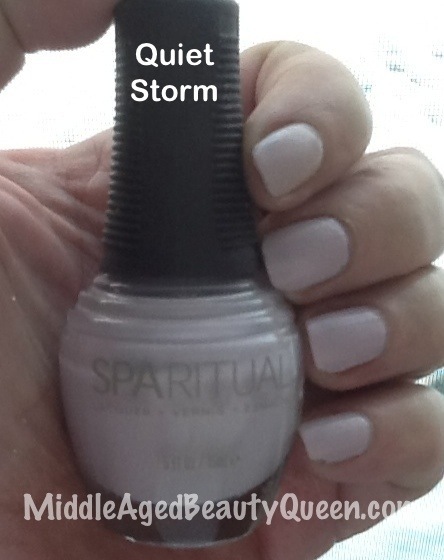 Quiet Storm is a great neutral and I really liked it. Spa Ritual is a vegan, cruelty free polish that was developed by the daughter of the man who started the Orly nail polish company. (As aside note, Orly is also a cruelty free company. The “Leaping Bunny” logo is on every bottle. Not to be repetitive , but the “Leaping Bunny” logo represents not only Spa Ritual as a cruelty free company but all their suppliers are also certified as being cruelty free. I have purchased the few bottles of Spa Ritual I own at TJ Maxx for a reduced price. I don’t remember how much they were, but I think the regular price of Spa Ritual is $10-12. I haven’t checked but I’m sure Spa Ritual available at Amazon.com and other Internet sites, such as Nail Polish Canada. Have you tried this brand? Let me know if you have and what you think of Spa Ritual. We had a few days of nothing but snow, which is unusual for our little town. We are in a valley with mild climate so when it does snow it’s usually gone that same day. This time those there was good 6″ that stuck. 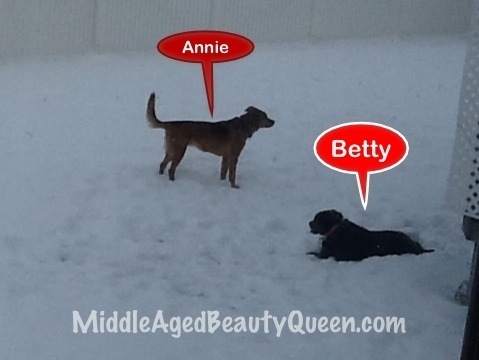 My dad’s dog Annie and Betty absolutely LOVED playing in the snow. Betty would lay down on her back with her legs open like she was trying to make a snow angel. They had so much fun playing. The other fun thing about the snow is we had a bunch deer coming through the yard. I’m always amazed at how they just jump the 6′ fence like it was nothing. We had 2 big females, one looked pregnant, a baby and another group of boy deer. It’s been fun watching them. A short 3 days later and the snow is all gone, the sun is shining and we are back to our normal weather. 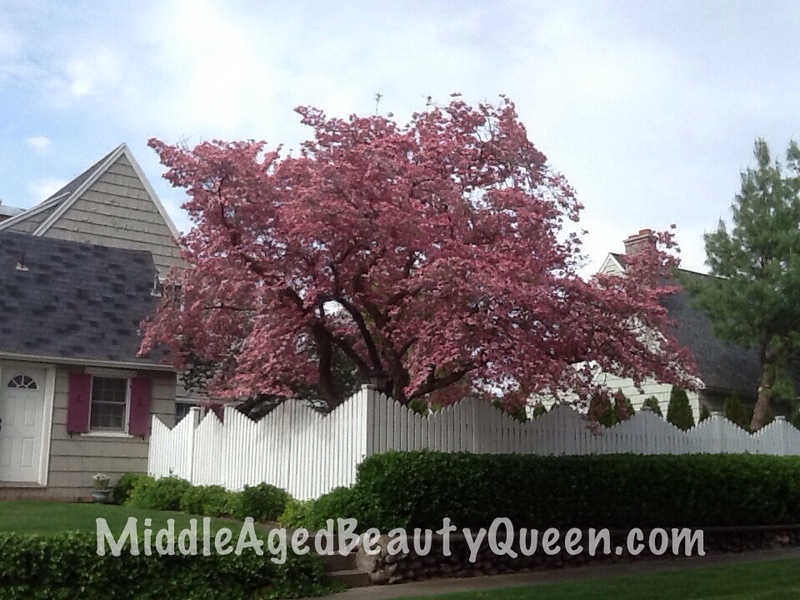 Which is good, mild in winter is good. 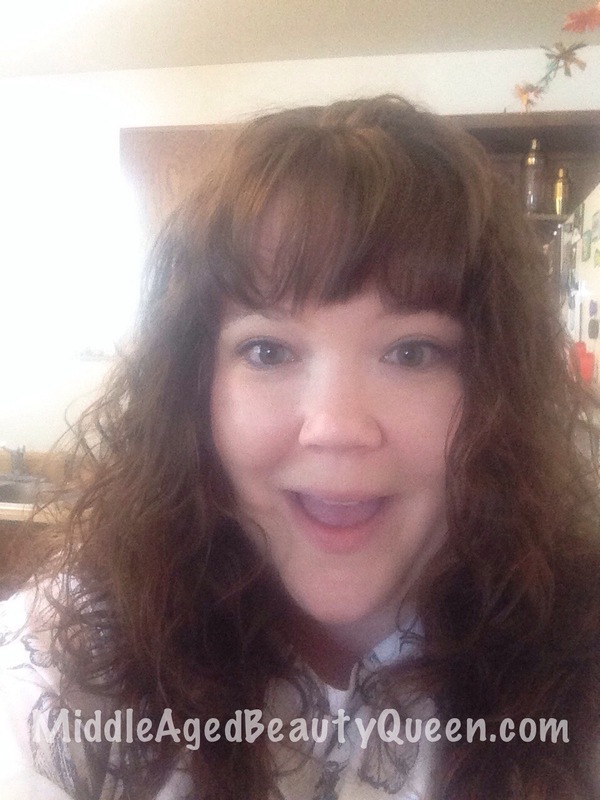 It’s a great day today, as Ashley will be home for a 2 week visit.. Yay! She moved to Tennessee right after Jilly and Bryan got married. I have missed her more than I thought possible and cannot wait to see her face. Jud, her dad, is on his way to Spokane to pick her up from the airport. So it won’t be long til I can hug and squeeze my girl. 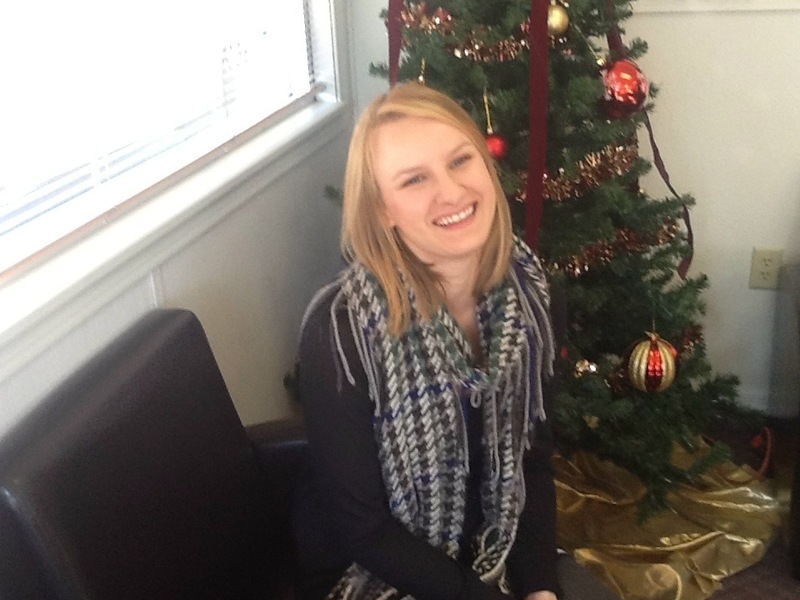 Welcome home Ashley! !